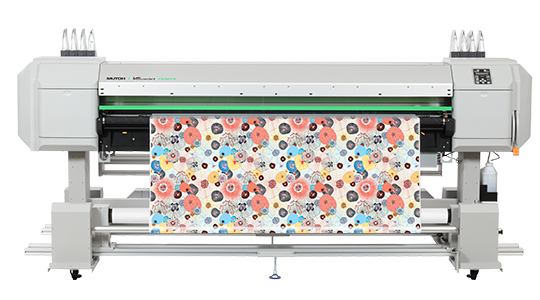 Specifically targeted at sampling of short run on-demand & local digital production of garments, upholstery, fashion, swimwear, interior deco fabrics, home textiles, flags, etc.., the VJ-1938TX – a 75″ (1910 mm) wide dual staggered head printer – combines proven technology with a high-precision mechanical design. Developed in Japan, Mutoh’s ValueJet 1938TX incorporates technology proven to be faster, more reliable, more cost effective and more efficient to bring you the best output for your application. The 1938TX can print on closed, open non-stretch and limited stretch fabrics thanks to the incorporated ink gutter and a newly engineered high-end fabric feeding, tensioning and take-up system which will guarantee worry-free feeding and transport of fabrics. The preferred solution for garment printing professionals! Using Mutoh’s new water-based textile pigmented inks, the VJ-1938TX enables direct printing on cotton fabrics, rayon or mixed fibre fabrics. The VJ-1938TX printer can also jet Mutoh’s genuine DS2-series universal sublimation inks for direct printing onto polyester fabrics.